White Paper Abstract: When success in a fee-for-value framework calls for a care coordination vision focused on the highest-risk, highest-cost patients, organizations must possess the tools to capture this critical population. Healthcare has amplified risk stratification efforts in the last two years, with the number of risk prediction programs rising from 66 percent in 2014 to 79 percent in 2016, according to the latest Stratifying High-Risk Patients survey by the Healthcare Intelligence Network. This year's survey dove more deeply into risk prediction. And while clinical data prevails in risk assessment for 80 percent of 2016 respondents, healthcare organizations increasingly factor in socioeconomic determinants—income, age, mobility, etc.—when predicting risk. In fact, close to half of 2016 respondents (45 percent) evaluate this socioeconomic data, placing this input on par with hospital discharge data in terms of its value to risk stratification. The 2016 survey also explored the emergence of 'rising risk' identification. Seventy-two percent identify rising risk populations for closer care management, with the goal of preventing migration to high-risk status, where complex and costly health episodes prevail. Frequent utilization is the key hallmark of a high-risk patient, say 37 percent. A robust risk stratification intervention requires access to reliable and actionable data. However, for more than a quarter of 2016 respondents, assuring data integrity remains a key challenge to risk prediction. "Stratifying high-risk patients is very difficult at this point due to multiple data sources to monitor health disparities and quality improvement opportunities," said one respondent. 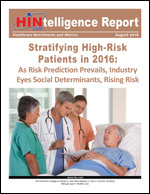 Download this HINtelligence report for more data on the prevalence of risk predictor tools and interventions; the top intervention available to high-risk patients; the most common component of a risk stratification infrastructure and the greatest barriers to risk stratification success.